Spokane Rising | Page 2 | It's our city. Let's build it up. Fresh off the news of a new residential mixed-use complex on the East End of downtown Spokane, and the release of the first renderings of a redeveloped Macy’s Building, the Spokesman-Review reports that the Wonder Bread Building on the North Bank of the Spokane River has changed hands. The handsome, historic brick warehouse has obvious character, which is why we named it our favorite block in Spokane, and the block with the most obvious potential for adaptive reuse. The building, first constructed in 1909 and extensively remodeled in 1947, sold to an investment group named Wonder Spokane, LLC. Investors include Pete Mounsey, a Spokane native and resident of Denver, Colorado who most recently remodeled the Lincoln View Apartments on the lower South Hill with local architecture firm Nystrom + Olson. The group has no specific plans, but notes that mixed-use is a strong possibility. Zoning code would allow up to twelve stories on the site. In the spirit of our recent Facebook post, jump after the break for our redevelopment wishlist. Is the West End of Downtown Spokane the new East End? Yeah, it’s a somewhat counterintuitive question, given that during the revitalization wave that swept downtown Spokane during the early 2000s, it was the West End, and not the East End, that received a majority of the conversation. 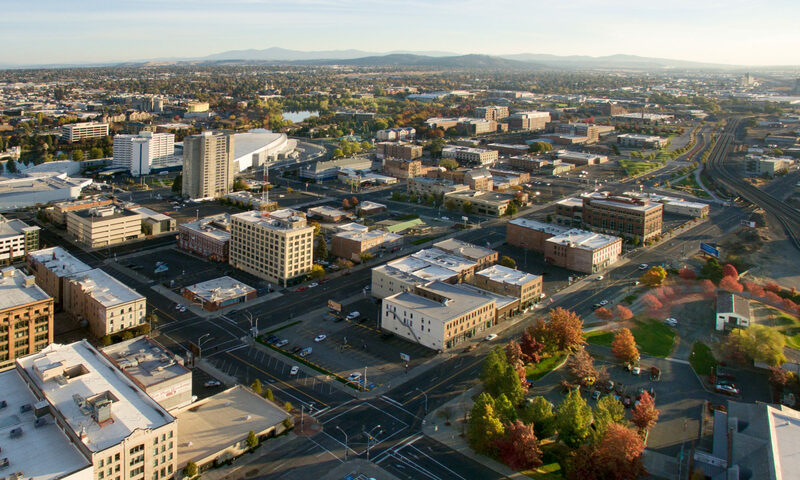 (The West End refers to the area roughly between Monroe and Maple along Sprague, Riverside, and First Avenue in downtown Spokane.) And why wouldn’t it? It’s near a significant arts corridor, including the historic Fox Theatre, the Bing Crosby Theatre, the Knitting Factory, and a number of other establishments. The area also was the original host of Terrain. But on the other hand, there are significant signs of life on the West End that give us reason to believe that there may be an upward swing underway in the district. Here’s a list of the exciting and important projects ongoing on the West End. 1400 Tower || This project, from developer Mick McDowell, will construct a $20 million, 17-story condominimum building with 52 units. Plans include a three-story parking garage accessed from Peaceful Valley, a plaza on the Riverside Ave side, and luxury amenties. West End Lofts || The Norman-Jefferson Building will be remodeled to include 10,000 square feet of first-floor retail and around 24,000 square feet of residential space on the upper floors, for a total of eight loft condos. This project lies at the opposite end of the block which also houses the former Otis Hotel building. Steel Barrel and Zona Blanca || This exciting project includes a brewery incubator led by Steel Barrel Brewing and a ceviche bar, Zona Blanca, owned by famed chef Chad White. A number of other breweries will be sharing the space, including Young Buck and Little Spokane. This should lead to a brewery district of sorts, with River City Brewing, Iron Goat, Steam Plant, and Orlison nearby. NoLi Brewing also pondered opening a downtown taphouse last year, but we haven’t heard anything since. Montvale Hotel and Montvale Hall || This block has been undergoing significant transition, with the addition of Brooklyn Deli, Gilded Unicorn, and a number of other establishments. With the new owner Jerry Dicker and Ruby Hospitality in control of the Montvale Hotel and the Oddfellows Building, expect renewed activity and significant renovations, including a new events center called Montvale Hall. Hopefully this new activity will spur redevelopment of the Music City Building, which formerly housed Terrain. 1207 W 1st Ave || Preliminary planning documents indicate a proposal for a restaurant in the building located at 1207 W 1st Ave, which currently houses storage for North by Northwest. No specifics are given including the type of restaurant, and a pre-development conference does not guarantee future development, but the applicant notes the intention to create an outdoor patio area on the site. Certainly these projects and more indicate that there is a level of interest in the West End that hasn’t been seen since before the economic crisis. Hopefuly development in this area will continue to surpass expectations, and we’ll keep you posted as these projects move forward. Share your thoughts below in the comments on what you hope to see in the area next. SHARE YOUR THOUGHTS: Are you seeing a renewed interest in the West End of downtown? Would you live or work in the area? Would you oepn a business there? Is there a building that you’d particularly like to see redeveloped, like the Otis Hotel? And what of the idea of a “brewery district?” Would you be a fan of such a development? Share your thoughts below in the comments, on Facebook, on Twitter, or in person. We love to hear from you!